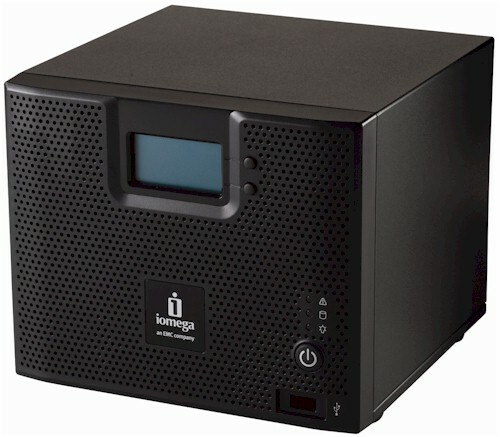 Summary Marvell-based four drive RAID 5/10 NAS with iSCSI, backup to/from rsync targets and CIFS shares, secure remote access and media services. Iomega is on a mission to remake its StorCenter NASes into better combatants in today's bare-knuckled NAS competitive arena. If the StorCenter ix4-200d is any indication, it's going to be a fairer fight than it has been. Our last look at an Iomega StorCenter NAS was the ix2, which Jim Buzbee found to be a pretty good value, even though it didn't have chart-topping performance or the biggest feature set in town. The ix2 did, however, have EMC's new Linux-based LifeLine OS, which brought a nicely-redesigned management interface and new features that made it a big improvement over its predecessor, the now-defunct StorCenter Network Hard Drive. The ix4 also runs LifeLine and so shares the ix2's features. But it also brings a few new tricks of its own, including the ability to perform immediate or scheduled backups to and from attached drives, rsync servers and SMB/CIFS network shares. Yep, you read that correctly. This means that NETGEAR's ReadyNASes are no longer the only NASes that can do the backup to/from network share trick. Figure 1 shows the front of the ix4, with all callouts explained in the larger image. The front panel LCD display is a nice touch and rotates between showing the date and time, IP address and volume Free / Used. Figure 2 shows the rear panel, where You can see two USB 2.0 ports (for a total of three), power connector, dual gigabit Ethernet ports with support for 4000 and 9000 Byte jumbo frames, failover and 802.3ad aggregation, and a nice, quiet fan. Unfortunately, there is no eSATA port to attach external drives for speedier storage expansion or attached backup. While the ix4 was running it drew a fairly low 35 Watts, and was surpringly quiet for a four-drive NAS. When the programmable drive spindown kicked in (5, 15, 30, 45, 1hr, 6 hr), power dropped to 13 W.
As with the ix2, a configuration wizard walks you through the basic configuration steps of setting the password time zone, network parameters, etc. during the first login or when invoked from the Settings > Device Setup tab. Note that although it's undocumented, the admin interface is also available via secure HTTPS. But it won't auto-forward you to HTTPS if you connect via HTTP.